The diversity on display at the wedding of Prince Harry and Meghan Markle represented progress that much of the westernized world has yearned to see. As an African American, I was happy to see Oprah Winfrey in attendance. She has long been, especially within the black community, American royalty. 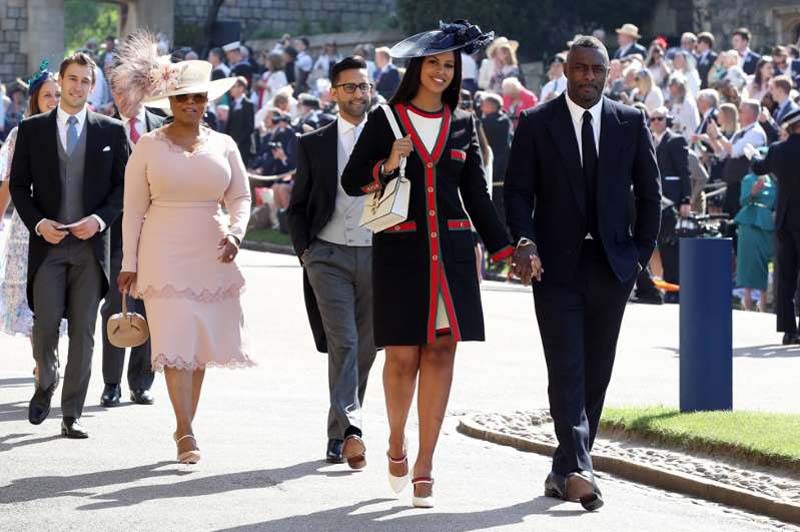 Watching her arrive alongside the actor Idris Elba set the tone for the rest of the wedding, and forged a connection to the ceremony that black Americans had never previously had. Harry is the British royal Americans can relate to more than any other. He befriended the Obamas and partied in Las Vegas long before his engagement to Ms Markle. He is more accessible and less formal than his immediate family, and his marriage to a biracial American celebrity seems to make sense. As an American, I felt a connection to not just the guests, but also both of the royal couple. After the vows, viewers were wowed by teenage cellist Sheku Kanneh-Mason, and by stirring renditions from the Kingdom Choir of "This Little Light of Mine" and "Stand by Me". #BlackRoyalWedding and #BlackExcellence began trending on Twitter. Amid all these moments of significance, it was Bishop Michael Curry's sermon that felt most profound. His modern, unorthodox invocation of love and unscripted reference to American slavery spoke to the very heart of black theology in America. Black ministers first began to speak in front of white congregations after the Civil War, and for those white parishioners who overcame racist beliefs, the sermons became transformational events. "Here was an unlearned man, one who could not read, telling of the love of Christ, of Christian faith and duty in a way which I have not learned," said white Baptist Minister Isaac Brinckerhoff, upon witnessing the sermon of a black preacher in South Carolina soon after the Civil War. But the style of black preachers was also condemned by many whites, and Southern churches became increasingly segregated after the Civil War - racial divisions that have remained largely intact since. I'm from the American South, and my family still attends a predominantly black church. Since Reconstruction, the black church became the backbone of our community, and both our intellectual and spiritual hub, but rarely could the messages inside the church thrive outside of our community. Martin Luther King was one of the few black ministers to successfully voice his black Christian philosophy outside of the black community. Seeing a black minister address a predominantly white congregation remains relatively rare. But on Saturday, Britain's Royal Family broadcast that very image around the world. Bishop Curry's sermon told us that a society focused on love can reshape the world for the better, and he drew inspiration from the interracial couple before him. The foundations for his sermon lay in the teachings of the American Episcopal Church (a denomination of the Church of England), but also in the struggles of African Americans during slavery, the philosophy of King, and the teachings of obscure French Jesuit scholar Pierre Teilhard de Chardin. Bishop Curry's presence represented a significant leap for British royal tradition, and regardless of whether you were inspired by his sermon, it was clear that it could help transform the monarchy for the better. The new Duchess of Sussex has, in a relatively short period of time, made the British monarchy more accessible and diverse, and she has shown us that diversity and progress can make established institutions stronger. As the UK begins to deal with Brexit, and America adjusts to Donald Trump's presidency, it is clear that many still see diversity as a threat to their culture. The royal wedding showed us that love, across race and nationality, can update traditions, strengthen bonds, and forge a community in which more people feel included, represented and appreciated. In America, the Obamas set the example of what a diverse, inclusive society could look like, and despite our nations' obvious setbacks, the marriage of Harry and Meghan feels like a welcome passing of the torch as both countries strive to build more racially just societies.